Submissions from the Lane 9 Project community, in response to our January writing prompt “I Weigh”. I am inherently valuable because I exist. And it has absolutely nothing to do with what I weigh. Technically speaking, I weigh an arbitrary amount measured in pounds or kilograms, or “good” or “bad.” I am the culmination of bones, blood, muscle, and neurons. In some ways, I weigh a number. In most ways, I weigh so much more. I am a human being, not a number. You cannot measure the amount of lives that I touch, the weight behind my “I love yous,” or the volume of my mind. I am a verb- I live, I breathe, I run, I break, and I heal. Last I checked, you can’t weigh verbs. I weigh two feet and two legs who have the privilege of walking through society without ableist barriers to cross. These feet can tell you war stories of toenails lost and pulled off, of blisters created from friction and burst open all the same. These legs will tell you tales of thousands of miles pounding pavement, gravel, mud, and all variations of weather. They will tell you of the burning of five marathons run, of the brutal training leading up, and of the many more cycles to come. 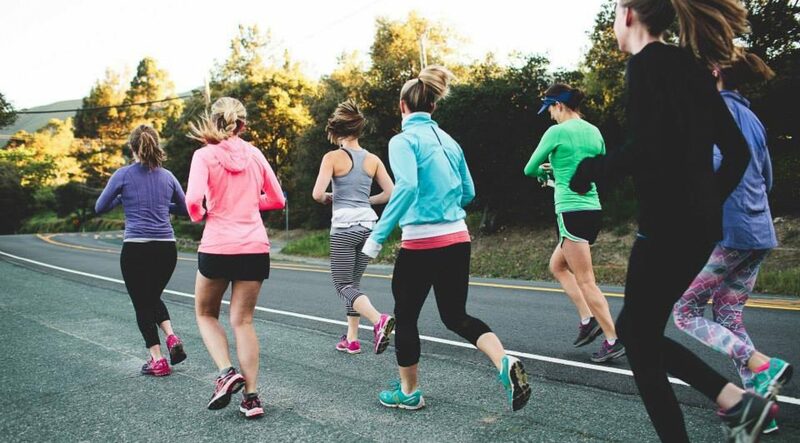 If you were to ask, they would explain that they love the grind of running. When my legs run, they become. Can you weigh memories of the miles? I weigh a spine and a heart. My spine of steel has carried me into the battlefield more times than we can count. I’ve trusted that it will always be there for me. What I failed to notice is that for years, it’s been whispering, begging me to slow down. My eating disorder spoke louder than the desperate cries for help. With a diagnosis of spinal osteopenia at the age of 21, I finally heard her. How can you weigh a spine that has been slowly disappearing? Does a heart weigh more the more it’s been broken? Does healing act as a heavy cast, setting it on the allotted path toward recovery? Or does it weigh less, and lose volume every time it shatters? The first time my heart broke, was when my mom was diagnosed with breast cancer. At 16, I gathered the weight of my family and carried it on my shoulders. After enough time, a crack formed right in my chest. It did not heal. The next time my heart broke it was out of pure necessity; I was slowly killing myself. My eating disorder was systematically shutting my life down, stealing joy as well as vital organ function. The third time, I broke my heart myself. With a relapse into my eating disorder, I cracked it open like an egg into the mixing bowl. Full commitment to recovery requires an emptying unlike any pain I’ve ever experienced. The transformation from a life of obsession to a wholehearted one is like waking up every morning and purposefully breaking your own heart. How much do these heartbreaks weigh? They say that although they are the most important part of us, human brains only weigh about three pounds. In a way, my brain weighs as much. In a much greater sense, my mind cannot be measured. The power of the human mind is infinite. It is the hope that one day, things will feel better. It is the decisions to lace up and run on the darkest mornings because you know it feeds your soul. My mind is my passion to serve others, the gratitude I feel for every mundane moment of ordinary joy, and the pride I carry for my ability to save my own life. It is the stars above us providing light in the darkness, it is the ground underneath us promising stability on the worst days. You can weigh my brain, but not my mind. Technically speaking, I’ve been weighed many times; by myself and my eating disorder, by my treatment team, and by doctors who think that my weight still carries any weight of knowledge. In the grand scheme of it all, I weigh so much more. We all weigh our unique presence in this wonderful, terrifying, beautiful life that we share. No scale will ever be able to capture that. I weigh so much more than the arbitrary number on the scale beneath my feet, which is merely a product of the force of gravity holding me down to Earth. I am all the places those feet have carried me, and the body connected to those feet. I am the heart beating powerfully inside my chest, which has empowered and emboldened me to attempt great feats – some resulting in success, and many others in failure. I am the mind that cultivates creative, unique ideas, that weaves strings of words together to pen interesting stories and letters that melt the hearts of those who read them. The mind that plans and executes engaging and entertaining lessons for young children. The mind that plans, problem-solves, and perseveres in times of adversity. I am the sister who keeps texting her little brother who lives 1000 miles away, just to make sure he’s ok. I am the daughter who writes her mom letters, reminding her how much she cares. I am the wife who packs her husband healthy lunches she hopes he’ll also enjoy. I am the friend who organizes fun social events so I can bring more people together. I am the teacher who comforts anxious parents over late night phone calls. I am the co-worker who is the first to offer a lending hand. I am the runner who was once obsessed with what I weighed, believing that the smaller that number was, the faster, more successful, and happier I would be. But I haven’t checked in on that number in quite some time now, and it feels pretty liberating. That number does not define me. I weigh the comments of others in my mind. Is that true? Do I believe that? Letting others thoughts, opinions, and judgements seep into the recesses of my being. Why do I care so much? Why do I allow them so much control over my sense of self-worth? I weigh each of my own words long after their echo has faded into silence. Did what I say offend someone? Did they correctly interpret what I truly meant to say? What if I was wrong about that situation? Over and over in my mind, again, and again, until it’s hard to remember what I even said at all. I weigh the pros and cons of every decision. I want to always make the right decision. The best decision. Except…sometimes, it’s impossible to know which one is the best, and you just have to take a leap of faith and make a decision. I weigh the value of myself against so many subjective and illogical measures offered to me by the world as the true way to determine my worth. But I know that I am valuable no matter what. Regardless of my accomplishments, of others opinions of me, of my physical appearance, of my athletic performance, of my wealth, of my contributions to society. These days I don’t weight myself in pounds, but in gold stars, instead. What I weight is 5,000 gold stars of compassion, 10,000 gold stars of resilience, 15,000 gold stars of dedication, and a whopping 20,000 gold stars of courage. My gold stars of compassion help me look kindly upon others, both while running and while living life, realizing that, like me, everyone faces adversity and is usually doing the very best they can. My gold stars of resilience have helped me to keep putting one foot in front of the other through the challenges I’ve faced, whether it be struggling with an eating disorder or struggling to finish a cross country race. My gold stars of dedication help me focus on what is most important, my family and my recovery. Last, but not least, my gold stars of courage have helped me overcome my eating disorder, my social anxiety, and an unhealthy relationship with exercise. Learning to do things differently is scary, but approaching it with courage has lead to success and fulfillment. The number the scales shows when I step on it gives no indication of any meaningful weight. I am glad I now have a gold star system to express what I really weigh. Contribute your essay, or share your story, with Lane 9 Project.